If you want to understand the history of modern horses, start with their toes. With just one toe per foot, horses are something of an outlier in the animal kingdom, but it wasn't always that way. As hard as it may be to imagine, their earliest ancestors were typically about the size of a small dog, and sported three toes on their front legs, and four on the back. Harvard scientists are shedding new light on what drove those changes, and in a new study show that the dual pressures of increasing body weight and shrinking side toes prompted early horses' middle toes to become dramatically stronger and better able to resist forces. The study is described in an August 23 paper published in Proceedings of the Royal Society B. 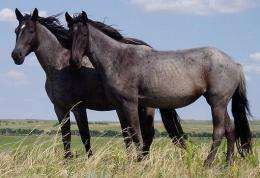 "The story told in most textbooks and museums is that as grasslands gradually took over from forests, horses got bigger, and they reduced their toes to a single digit," said first author Brianna McHorse, a Ph.D. student working in the labs of Assistant Professor Stephanie Pierce and Professor Andrew Biewener in the Department of Organismic and Evolutionary Biology. Selective pressures from new open terrain are hypothesized to drive these changes in digit reduction and body mass - but what are the underlying mechanical consequences of standing on one toe? When in horse evolution did their side toes become non-functional? To quantitatively test these questions, the team performed micro-CT scans of 12 fossil horse species then used engineering "beam bending" analysis to calculate how much stress each species' lower leg bones were experiencing during normal movement and high-speed running. The stress data were then compared to the fracture stress of bone. "We assessed bone stress in two ways - the first was to assume a body weight load on the center digit, which is consistent with what living horses experience, but this ignores the potential load-bearing capacity of the side toes of earlier horses," McHorse said. "The second thing we did was to scale that load relative to the size of the side toes, so the larger those toes were, the more load they take off the center digit." The results, she said, showed that, for many early horse species, those side toes played a critical role, helping to bear some of the animal's weight to avoid unsafe levels of stress - and potential bone fracture - on their middle digit. But as horses continued to evolve larger body sizes things began to change. "As body mass increased, and side toes shrunk, the middle digit compensated by changing its internal geometry, allowing ever-bigger horse species to eventually stand and move on one toe," Pierce said. "The bone within the load-bearing digit of later horses was distributed farther away from the center of its cross-section, allowing it to better resist bending. The total amount of bone also increased, allowing it to better resist compression as well as bending, which are of critical importance for animals with large body sizes." Ultimately, the team said, the study offers the clearest story yet of not only how, but why, horses took a common evolutionary theme like digit reduction and - literally - ran with it. "Digit reduction is a repeated theme throughout evolution, but going all the way to a single toe...is an uncommon strategy, and in fact horses are the only living monodactyl [single-toed] animal," McHorse said. "[Despite that,] horses can do some pretty high-performance things - they can run at high speed, jump, and dodge sideways very quickly, and properly trained, they can cover 100 miles in a day. And plenty of people don't realize they do it all on one toe."